Clear, black, grey, red, blue, gold. Color matching available for additional cost - contact us for more information. Anodizing is an electrolytic passivation process that grows the natural oxide layer on aluminum parts for protection from wear and corrosion, as well as for cosmetic effects. 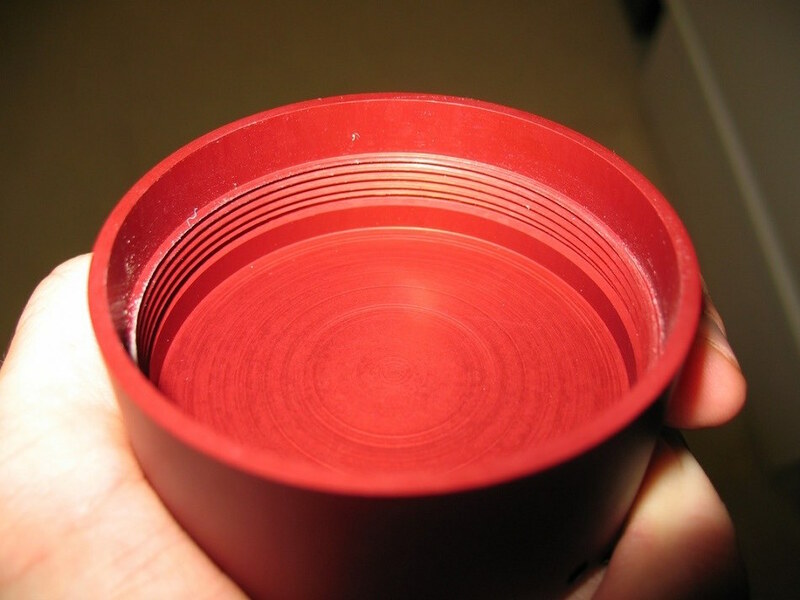 It is a conversion coating, similar to Alodine, meaning that the surface of the aluminum recedes dimensionally before the protective oxide layer is built up. After the process is complete, the oxide layer is integral to the aluminum substrate below, meaning it won’t chip or flake. The name anodizing comes from the fact that the treated part forms an anode (positive electrode) in an electrical circuit. During this process, the part to be anodized is hung on a conductive rack, submerged in an electrolytic solution, and a direct current of electricity is introduced. While the acidity of the solution dissolves the oxide layer of the part, the electric current releases oxygen at its surface, which builds up a protective layer of aluminum oxide. By balancing dissolve rate with build-up rate, the oxide layer forms with nanopores, which allows continued growth of the coating beyond what is naturally possible. The final steps of the anodizing process involve sealing the nanopores, otherwise they are the perfect passageways for corrosion initiation! Just before sealing however, they are sometimes filled with other corrosion inhibitors or colored dyes for cosmetic purposes. After the process is complete, the coating will be 0.0002-0.0012” in thickness, in accordance with the common engineering spec MIL-A-8625 Type II. - Plugging threaded/reamed holes is not required unless tolerances are very tight, as thickness change is minimal. If you require specific areas to be masked or plugged, please make sure to include a drawing. - Parts without holes are hung on conductive racks with spring clamps, wire wrapping, or other methods, which will leave small areas without anodize known as ‘rack marks’. - Anodize has insulative properties and thus anodized parts offer poor electrical conductivity. Type III Anodizing (commonly specified with MIL-A-8625 Type III in North America) is the same general process as Type II, and provides similar benefits of increased resistance to wear, corrosion, and other general environmental effects. However, this type is also known as hard or hardcoat anodizing, as the protective oxide layer must be thicker than 0.001”, with coatings up to 0.004” sometimes applied. Growing the oxide layer to a consistent and specified thickness requires far more process control than with Type II (read: time and money). In addition, hard anodize is performed using lower temperatures and much higher voltages and currents, the energy usage of which also costs more. A second tradeoff of Type III is the increased care that must be taken to ensure parts stay within specified tolerance. Whereas Type II thickness is minimal enough that most dimensions should remain similar after the process, even the thinnest Type III can impact a tight tolerance on a reamed bore, render a threaded hole non-functional, etc. Plugging holes and masking sensitive surfaces is almost always employed with this type of anodizing, and it is important that both the machinist and the finisher are informed of all requirements. - This process adds substantial thickness to a part’s surface, so plugging and masking threaded/reamed holes or other critical-to-function surfaces is recommended. - Parts without holes are hung on conductive racks with spring clamps, wire wrapping, or other methods, which will leave small areas without anodize known as ‘rack marks’. If there are areas on which you absolutely cannot accept rack marks, please make sure to include a drawing.